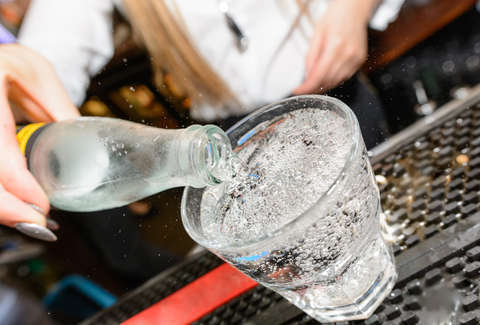 What’s the Difference Between Seltzer, Club Soda & Mineral Water? Long a staple among old-school Brooklynites and sauna-loving Europeans, it’s safe to say that our beloved bubbly water has officially entered the American mainstream. Peer inside any gas station cooler or grocery store soda aisle these days and you’ll inevitably be confronted with row upon row of crystal clear, effervescent sparklers. But whether you're chugging Club Soda off the gun, cracking open seltzer cans swathed in millennial pink labels or popping liter bottles of spring water with mineral-fueled swag, how much do you really know about what’s going on inside your life-giving glass? Maybe you ride or die for Topo Chico. Perhaps you represent LaCroix to the fullest. Either way, we can all agree that bubbles make everything just a little bit better. Let’s break it down. Seltzer? I hardly know her! Let’s start with seltzer, the Basic B of the bubble crew. Nothing extra to speak of here, just plain old water injected with a hearty blast of carbon dioxide. That means making an OG Canada Dry is as easy (and probably as satisfying) as using a SodaStream. And because they’re unadulterated and flavorless by definition, seltzer is what you’re most likely to find as the basis for all your favorite fruit-tinged crushers like Spindrift, Polar, Bubly, Canada Dry, and yes, LaCroix. The term seltzer can be used interchangeably with sparkling water, fizzy water, bubbly water, and soda water, thanks to its plain jane makeup. 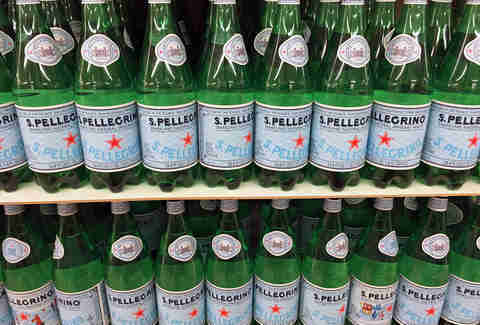 Contrary to its modern-day genericism, though, seltzer’s name was actually coined by an 18th-century German beverage company famous for selling naturally carbonated mineral water sourced from Selters spring in Niederselters. Go figure. Think of seltzer and Club Soda as Mary-Kate and Ashley Olsen. Sure they might have made a career out of playing the exact same person, but, fun fact, they’re actually fraternal. The beverage begins life as force-carbonated water (aka seltzer) before being dosed with a handful of minerals that may include sodium bicarbonate, sodium citrate, sodium chloride, disodium phosphate, and potassium sulfate. These fortifiers account for the slightly salty, tangy or metallic taste you might detect in your Schweppes, especially as it gets warmer and flatter (just like in beer, bubbles and cold temperatures numb your taste buds). Another fun fact: Back in 1877, Irish soft drink giants Cantrell & Cochrane trademarked the name Club Soda, claiming the enriched sparkling concoction could neutralize lactic acid in the blood. They still hold the patent in the UK. If you prefer your eau gazeuse au naturel, you’re going to want a big bottle of sparkling mineral water. This ~sophisticated~ option is spring water, meaning it comes straight from the earth, and is infused with its eponymous minerals -- sodium, magnesium, potassium, calcium or others depending on the source water -- through an underground rock and sediment-spurred filtration process. It also comes naturally carbonated, though some brands up the bubble factor by throwing extra CO2 into the mix. Said to have a more powerful restorative effect, the Europeans especially love the stuff and much of the sparkling water served overseas is of this variety. The FDA mandates that to be called mineral water, the final product has to contain at least 250 parts per million dissolved solids from its spring of origin and no added mineral content. This regulation results in different brands having prominent and distinctly unique flavors and mouthfeel (think: salty, velvety Italian San Pellegrino vs. Mexico’s crisp, slightly citrusy Topo Chico).